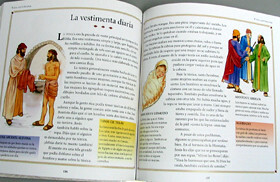 Fine art, Illustration, graphic design and the art philanthropy of Sam Morrison: Learning Spanish? Recently, at work, some of us have taken varied levels of interest in learning Spanish. Most of us have had at minimum one year of Spanish in high school. That limited knowledge has proven to be dangerous. Case in point, according to some instructors a good way to learn Spanish is to buy a book you're familiar with and try reading it. With each repeated reading certain elements should start to click. 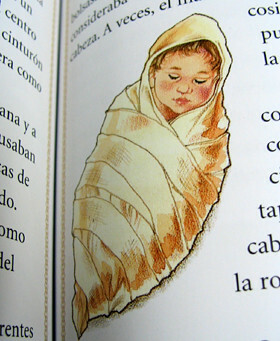 Well my boss bought a Spanish picture Bible. We're all familiar with Bible stories so that seemed like a good idea. The pictures would surely help too. Well, when I cracked open the book, the very first chapter I turned to was (in my limited Spanish) entitled "Investing in Diarhea"... I didn't remember that being in the Bible. I immediately looked at the pictures and those didn't help either. 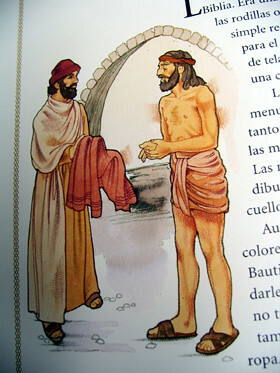 Pictured was a man standing in his underwear handing over his pants to some guy. I assume he's the man's broker. Even more confusing was the picture of a baby wrapped in toilet paper.... I don't know what the story is about but what I do know is, I can't hardly wait to learn Spanish to find out.